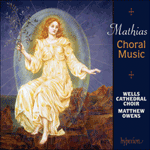 Mathias’s resplendent Festival Te Deum Op 28 (first performed in 1965 by the Manchester Cathedral choir under Derrick Cantrill) and O be joyful in the Lord (Jubilate Deo) Op 90 No 2 (written in 1983 for the University of Texas choir) are not strictly related, yet—as the keys blend perfectly—how brilliantly they complement each other. There is a Brittenesque ease, assurance and skill at varying textures. In the Te Deum, the men’s voice-led canon at ‘O Lord, in thee have I trusted’ is especially masterly, while the organ part of the Jubilate shows us Mathias in display vein, at his most brilliant.